How do you know you’ve got a leak? The nature of hidden leaks is such that it’s not always easy to know whether or not you have one! The last thing we want is for you to book an appointment, only for us to reveal that in fact there is no leak. We want your money to be well spent. There a number of tricks we’d like to share with you that you can do YOURSELF to help identify whether or not you have a leak before you book us. Take a mop bucket and fill it roughly 2/3 full with pool water. Take a marker pen and draw a line at the water level on the bucket. 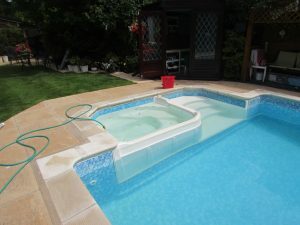 Then mark the water level at the edge of the pool (may be easier to use gaffa tape for this). Place the bucket on the second step of your pool so that bucket is partially submerged in the water and remains the same temperature as the surrounding water – meaning they are both subject to the same rate of evaporation. Return after 24 hours (at least) and observe the difference between the original and current water levels of the pool and the bucket. If the difference in the level of the pool and the bucket is the same (e.g both showing a difference of 2cm) then you don’t have a leak. If the difference in the level in the pool is GREATER than that of the bucket, then this does indicate a leak. If your pool is filled automatically, then a basic meter test will give you a wealth of information. Locate your water meter (normally found at the front of your property in a protective plastic box in the ground) and make a note of the reading. After half an hour (with no water usage anywhere else on property) take another meter reading. If the reading is the same, there is no leak on any of the appliances running off mains water, which also indicates no demand for water from the pool. If the reading has changed this could indicate a leak either on the pool, or on any other appliance using mains pressure on your property. In this case, you’ll either want to go ahead and book an appointment with us, or you could get your local plumber to come round and take a look to check there are no obvious problems with the water supply. 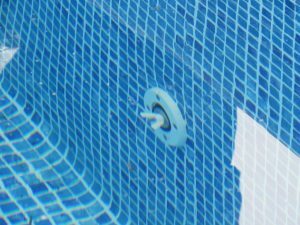 If you should suspect a leak on the filtration system, then an easy way to stop your pool losing any more water is to use bungs which can be bought from any swimming pool shop. They are normally in sizes of 1.5in or 1.25in for most domestic pools. Simply use the bungs to block the pipe suspected to be leaking at the pool end and isolate on the filtration system end. If the swimming pool ceases to lose water this confirms a leak on the isolated pipe. 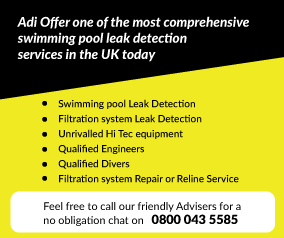 At this point call ADI Swimming Pool Leak Detection to find the exact location of the leak.